After the recent shooting at Marjory Stoneman Douglas High School in Parkland, Fla., both students and staff at WBHS have expressed their own concerns about the building’s safety. Some even believe that the school would be unprepared for an attack similar to what occurred in Parkland. Last June, Paulin and other high school staff members received ALICE (Alert, Lockdown, Inform, Counter, Evacuate) training that was intended to help prepare them for different intruder scenarios. However, according to Paulin, there has not been any sort of review for the teachers that were involved with the experience. When asked about plans for more ALICE training, East principal Darci VanAdestine explained that WBHS partners with the West Bend Police Department to coordinate follow-up ALICE trainings. West science teacher Paul DeLain is unsure about the readiness of the high schools, despite the special training that many of the teachers have received. Danielle Konstanz, an English teacher at West, is also concerned about the building’s numerous doors that cannot always be monitored. DeLain is faced with concerns regarding the number of students that regularly walk the halls during class time. WBHS has made efforts to minimize the number of wandering students by making some teachers hall monitors during their supervision period. 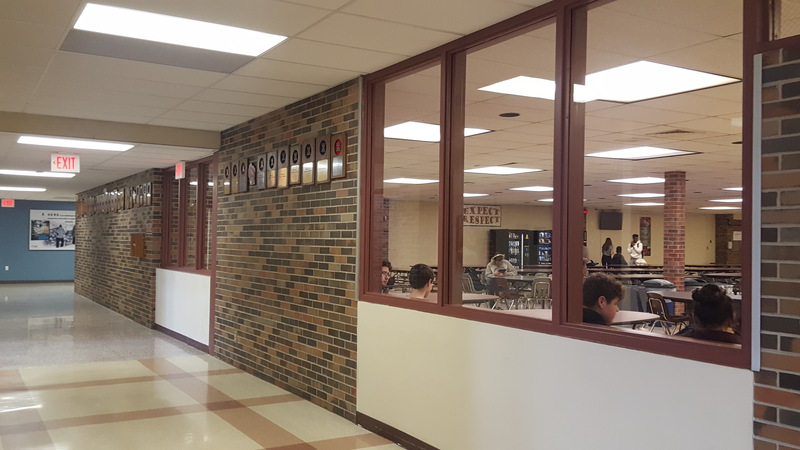 Some WBHS students worry the campus cafeterias have so many windows that students would be unable to hide from an intruder. Photo taken today by Jessica Steger, Editor in Chief. West sophomore Amanda Patrick expressed concerns about safety in the cafeterias. In response, West assistant principal Patrick O’Connor says that he does not feel unsafe in the cafeteria. 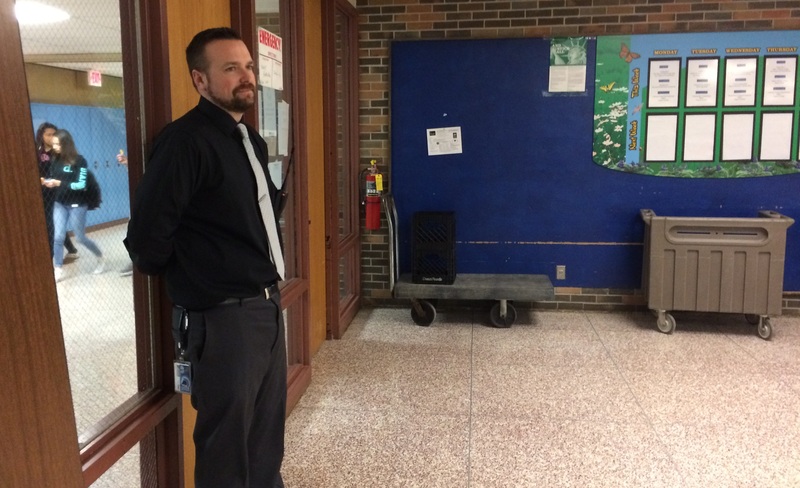 Nearly every day, he monitors the West cafeteria during lunch time, and there are other staff members at the doors as well. West sophomore Morgan Wahouske has worries about the security of the high schools’ entrances. She feels that when she arrives at school in the morning, there is nothing there to stop students from bringing in a concealed weapon. She added that she is aware that precautions like metal detectors can be quite expensive, but she thinks that a schoolwide fundraiser might be an option to cover the costs. According to West principal Ralph Schlass, there have not been any discussions about introducing metal detectors to the high schools. DeLain believes that any concerns or suspicions that students may have should be reported, just as the phrase “if you see or hear something, say something” encourages.